Since series registration for the 2018 Australian Production Cars season opened last week, entries have been flooding in and it was North Queensland’s Naylor Brothers Racing that was first off the blocks. Mitch and Leigh Naylor were quick off the mark, taking advantage of the early bird entry options and a further discount for signing up for the entire season ahead of time. “When we saw the new prices for 2018, we were very excited to see that entries had been made even more affordable,” Mitch said. “We think it is also excellent that the APC has shown the initiative to run its own Six Hour while largely reducing the cost for the overall season. “This instantly gave us more incentive to nominate for the whole year – the early bird entry specials along with the ‘whole series nomination’ deal is exactly what we think was needed, especially for teams like ourselves – small, privately-run outfits that don’t have incredibly deep pockets! “We think the Series is certainly taking a step forward with the new entry packages, the increasing of the live streaming to two days, and of course the Phillip Island Six Hour. There is one other aspect of early entry that appeals to the Naylors. “Our car number is important to us – Mitch and I have been racing in Karts for more than 15 years, Mitch with the number 2 and myself with the number 4 since day dot. So for us, the number 42 is something we wanted to keep on our race car, and early entry has ensured that we can do that,” Leigh Naylor explained. “We had a shocking 2017 season, with many mechanical failures and racing incidents. It honestly felt like we were bombarded with bad luck, so we are eager to start 2018 fresh and hopefully with all of that out of the way! While Series registration is proving a popular choice for competitors, those looking to enter event-by-event can do so as well. “We have been really pleased to see the pick-up of ‘whole season’ sign-ups since we opened registration last week,” APC category manager Iain Sherrin said. 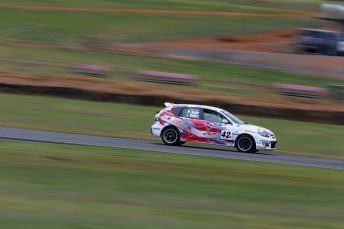 “We also released entry open dates and fees for those looking to enter individual events, with the first event at Sandown Raceway opening for entries on the 26th of February. “You don’t need to wait until February however to get your name on the list – simply complete the registration form and select which event/s you want to enter to secure your place. For more on the APC, please visit www.australianproductioncars.com.au or www.facebook.com/AustralianProductionCars or call category manager Iain Sherrin on 0422 449 446.